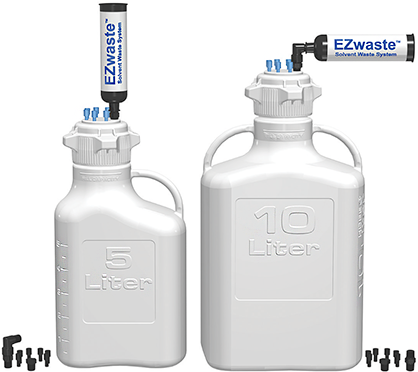 ​​Foxx Life Sciences’ EZwaste Solvent Waste System is designed to be an affordable solution for liquid waste disposal. Each system is manufactured to safely collect waste from one or more HPLC systems while the carbon exhaust filters improve air quality by capturing potentially harmful vapors emitted from solvents. It prevents chemicals from being inhaled by lab workers and provides an easy mechanism of disposal for vapor wastes. 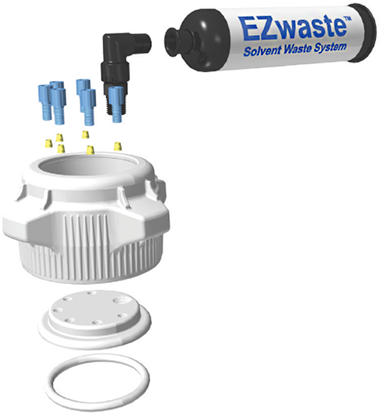 The EZwaste Solvent Waste system also features a closed loop design which protects against leaks and spills, improving overall lab safety. 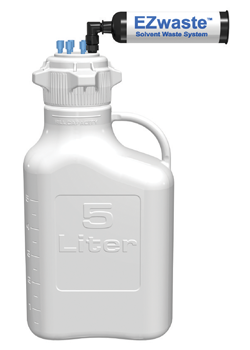 Each system includes a 4L, 5L, 10L, or 20L HDPE carboy, two 83mm VersaCaps (one open top for waste collection and one closed top for safe transport), 6 ports for 3.2mm (1/8”) OD waste tubes, 1 port for a carbon exhaust filter, 1 carbon exhaust filter, and plugs for unused ports. To further discuss the EZ Waste Solvent Waste System, and how we can help you to find the perfect solution to keep your process under control. Please contact us, or request a callback at a convenient time to suit you.